Find out today what they cook in Stuttgart! This is a Pork rolls recipe from the German city Stuttgart, the capital of Swabia, the so called "Schwabenland". We call this dish in German "Stuttgarter Roellchen" (Roellchen means tiny roll). The meat for the pork rolls is from the best part of the pig, the fillet, and it will be served with a creamy gravy and the most popular pasta from Swabia: Spaetzle. Happy Cooking! - Remove any skin, tendons or fat from the meat. Wash it under cold water, pat dry with kitchen paper. - Cut meat in slices about 1 inch thick. Flatten each slice slightly with the heel of hand (don't use a pounder). - Slice ham the same size than the meat. Place ham on filet slices, add some tarragon leaves. - Roll the slices and spear 4 of them on a skewer. - Heat clarified butter in a big skillet, brown skewers evenly on all sides. - Remove the frying grease, add the butter. - Cook the skewers another 2-3 minutes on low heat, remove from skillet, add salt and pepper. Wrap rolls in foil, and keep warm eg. in the oven. - On medium-high heat thicken the sauce briefly by boiling the stock together with creme fraiche, then add the cream cheese. - Reduce heat, cut butter in smaller pieces, add them one after the other (not at once), then add grated cheese. You can serve the pork rolls on the skewers or remove the skewers and place rolls on plates combined with gravy. 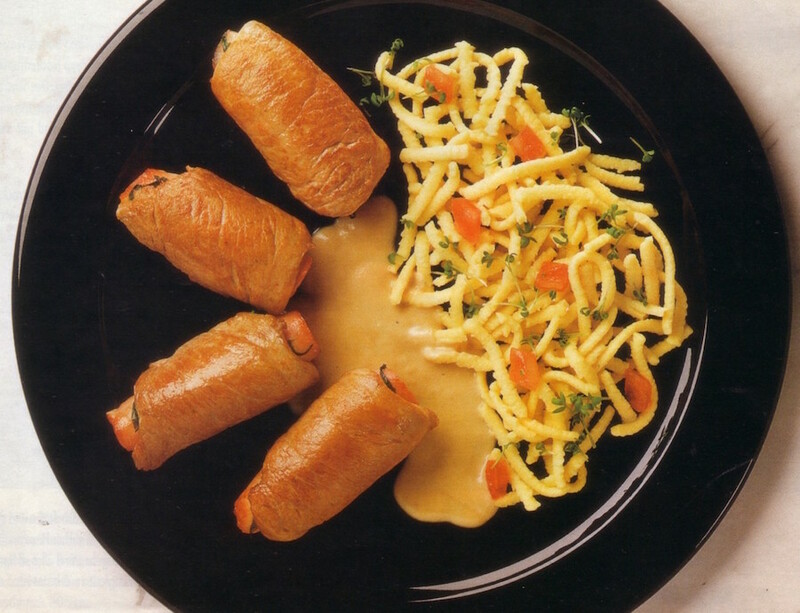 Serve the pork rolls with Spaetzle.